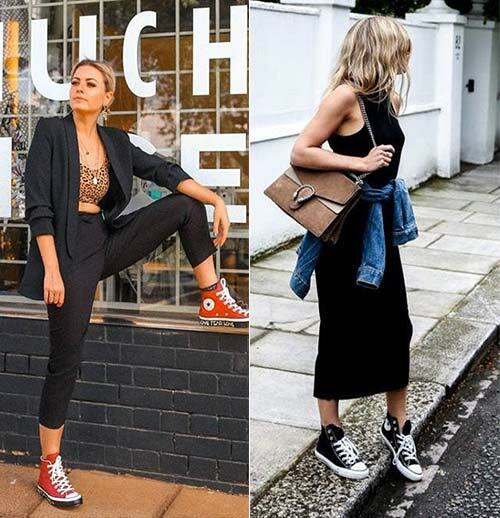 When it comes to constructing an outfit, Converse sneakers are absolute stars. How else do you explain people’s obsession with them? 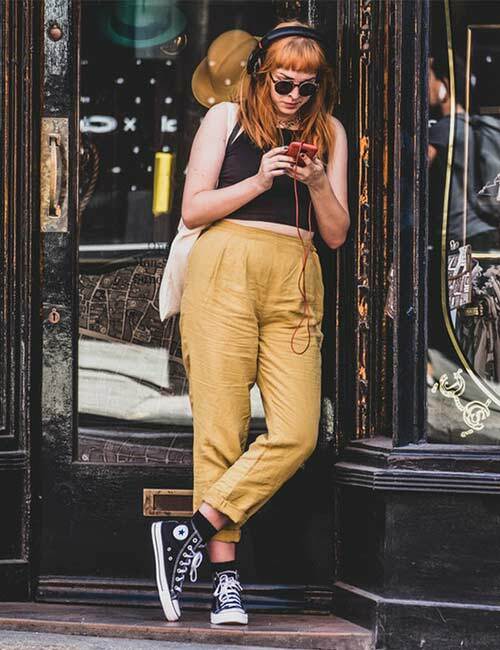 The best thing about Converse shoes is that they haven’t changed over the years but have adapted to the latest trends and managed to stay relevant to this day. 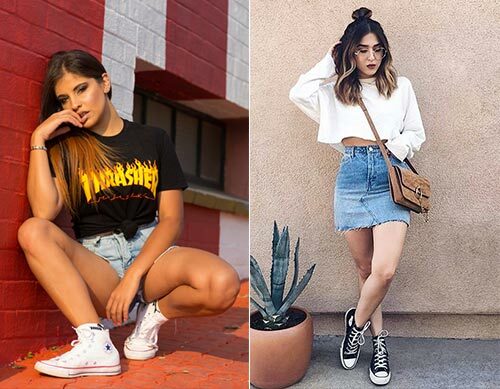 If that doesn’t say enough about Converse, we have proof – with pictures and outfit ideas. Check them out! If you have already jumped on the Converse bandwagon, you know that they go with pretty much everything. Jeans and skirts? Yep. Prom? Sure. Date night? Hell, yes. Wedding dress? ABSOLUTELY! Take a look! 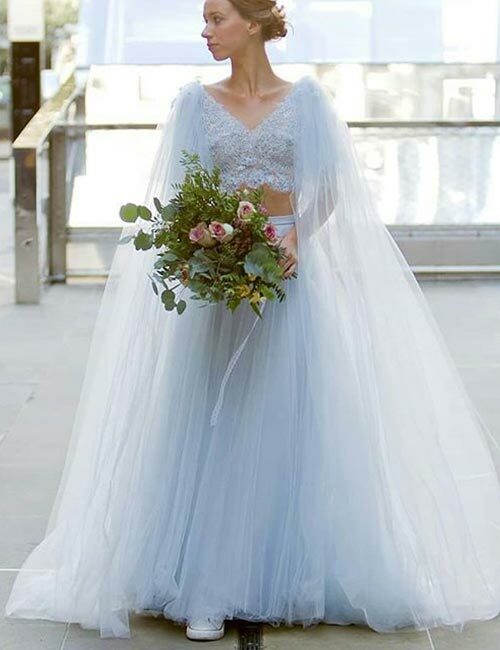 We wanted to start with the mother of all outfits – a wedding dress. Talk about brides breaking fashion stereotypes and choosing details that truly define who they are. An increasing number of women are sporting Converse with their fancy wedding gowns to showcase every bit of their personality while walking down the aisle. 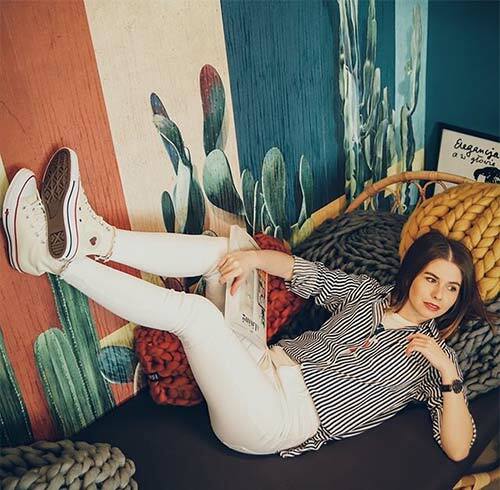 Skinny jeans – whether white, black, or anything whacky – call for Converse shoes. We recommend investing in a customized pair as they can spruce up your everyday outfits instantly. Denim and Converse are like a match made in heaven. But if you want to dial up the chic factor, pair high-waisted denim shorts with a bright graphic T-shirt. Such little changes can transform your look completely. If you thought that formals are one space Converse cannot venture into, you need to reconsider your opinion. 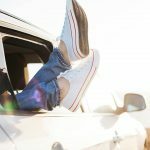 Whether you are headed to a meeting or are in the mood for comfortable trousers, throw on your favorite pair of Converse. Tell the world you choose comfort and like breaking the monotony with this look. 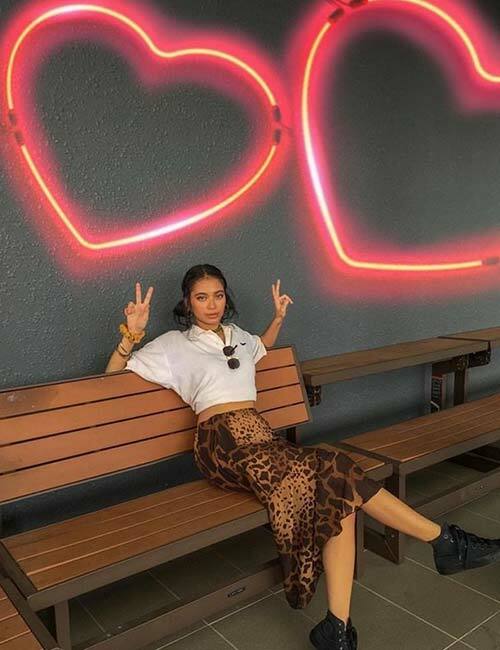 Animal prints add oodles of character to your outfits without trying too hard. 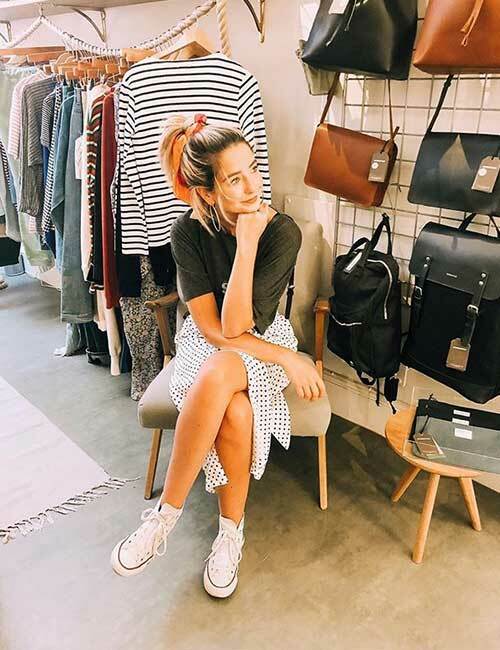 We get that they are not for everyone, but if you can pull it off, throw some leather Converse into the mix to round off your outfit! Prom night is around the corner, which means the anxiety of getting every single detail right is at its peak. If you march to the beat of your own drum, get yourself a pair of Converse shoes to comfort your feet and soul. I know it’s getting dramatic here, but trust me when I say that a lot of people will be coming to you for fashion advice after seeing you sport this edgy look. A trench coat is a staple piece in every working woman’s wardrobe. Match your trench color with a pair of Converse in the same color, sip on some pumpkin spice latte, and live it up! 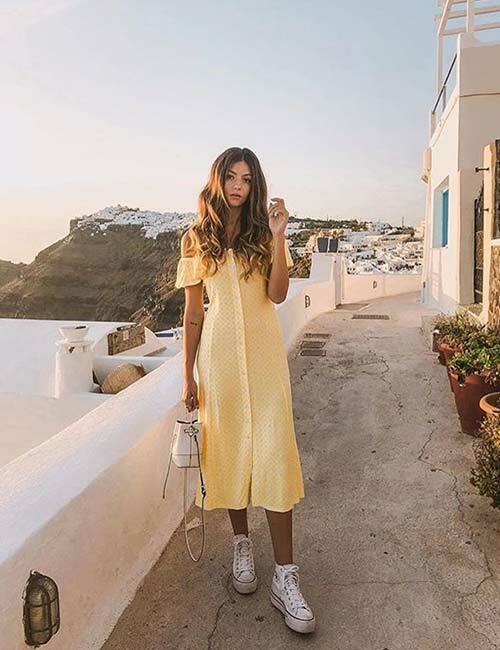 Whether it is a denim one-piece, a pastel noodle strap dress, or just a basic T-shirt dress – a pair of Converse will take it to the next level. Be it a midi-length, long, or short dress, rest assured that it can be paired with Converse. Whether you want to go all out with tulle or keep it semi-formal with a striped dress, Converse is the way to go! Skater dresses are jam-packed with cuteness and help you get away with bad hair days, lazy Sundays, and those days when you don’t feel like moving a muscle. Add Converse shoes to this equation and finish off the look! A black T-shirt dress is a blessing in summers. It is super comfortable and can never look outdated. Wear it with a pair of brightly-colored Converse, and you can conquer mountains. But if you want to take your black outfit up a notch, wear them with a casual pantsuit. Tie your hair in a half bun and put on some red lipstick to slay the look! Every part of your outfit needs to be thoroughly thought through when it comes to big events like a wedding, homecoming, or prom. But, you don’t always need to follow the stereotype and wear a dress and heels. 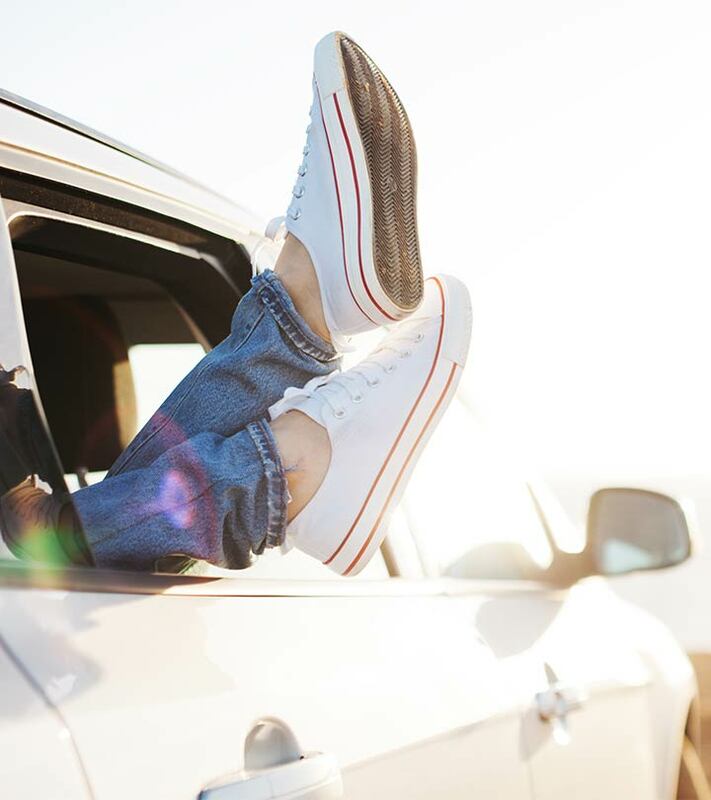 Break the monotony with your Converse shoes, and you will get heads turning! When you are in the mood to break the Bohemian vibe of your maxi or tea-length dress a little bit, take the sporty route. It’s a look everyone needs to try out. I can’t get enough of it! There is nothing else I can think of on a lazy weekend than an outfit like this. It’s fun, cool, and chic. Just a graphic tee with a ruffle skirt, a high ponytail, and a pair of converse. It’s airy and relaxed, but with just enough style. You can sport white converse with bold colors like red, navy blue, and green. Let the shoes take center stage and the dress be the sidekick for once. 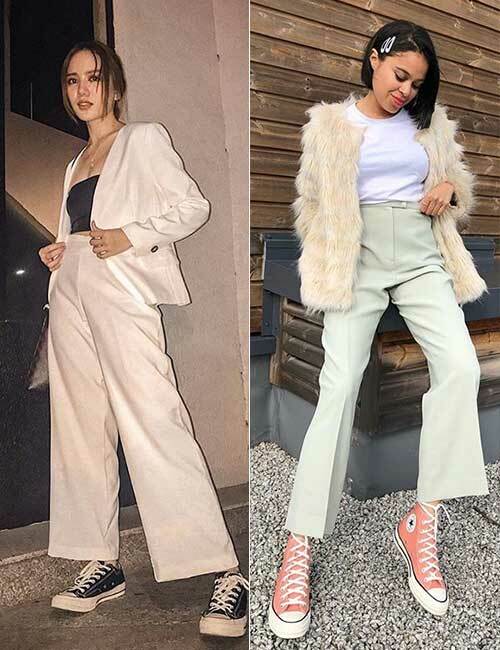 Black or white Converse shoes with colored trousers like these can make the oh-so-smart and effortless girl in you come out. 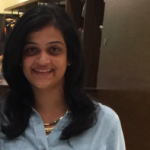 Envision this outfit without the shoes – it just falls flat! The one celebrity that comes to mind when we think of Converse shoes is Taylor Swift. 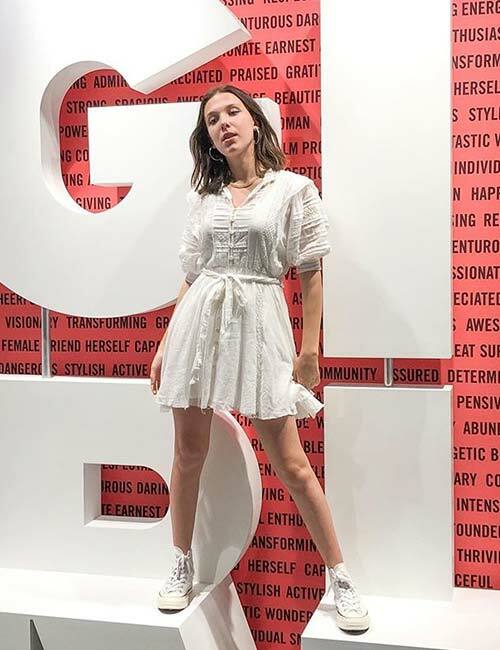 She is often spotted wearing bold outfits (like this patent leather number) with a simple pair of Converse to tell us that she’s one of us. This list is just a starting point for all the stuff that you can do with your Converse shoes. Unleash your creative side and slay it. Do you have questions or styling ideas? 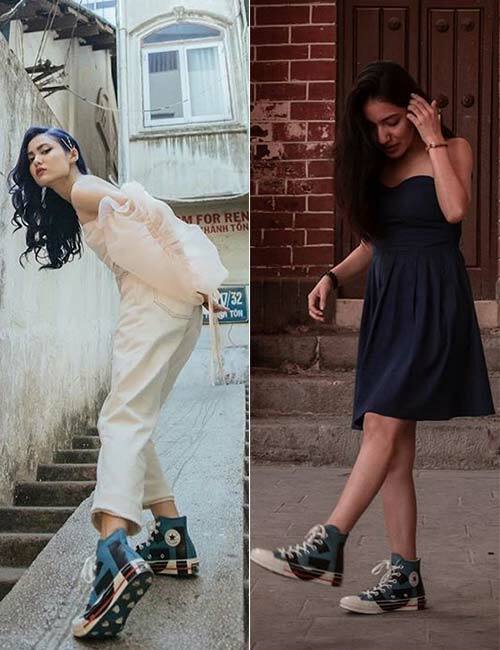 What is your favorite way to style Converse shoes? Let us know by dropping a message in the comments section below.